Atlas Glue Tabs – Special plastic tabs used to repair dents from automobiles using the glue pulling process. Atlas makes several styles of glue tabs including their Olympus, Titan and Cronos sets. 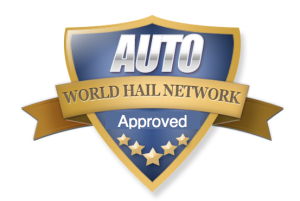 For hail damage, the Atlas glue tabs are among the very best! They pull strong, have a great feel to them which allows for better control and less knocking down. The Titan Tabs and the Cronos Tabs are great for large deep dents including bad hail damage, door dings and even minor collision dents. These tabs last for years without breaking and pull very consistently. With Atlas Tabs on your tool cart, you will not find yourself reaching for many other tabs. 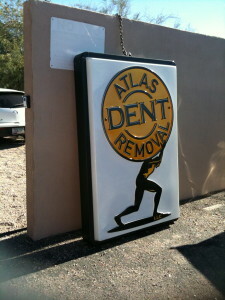 Every Board Member on the World Hail Network that repairs dents has had Atlas Tabs on their cart for years now. I have always been known as a tool guy. My philosophy was that I wanted my only limitations to be my skill level. I never wanted to fail at removing a dent cleanly because I did not own the right tool. This obsession was probably most noticed by my glue tab collection. I had bought every single glue tab that was introduced to the market. I spent hundreds of dollars having tabs shipped to me from all over the world. I traded tabs with other techs. I was never satisfied. I finally found some in Italy that were fantastic, but they would break often so I had to use them sparingly. When I came across Atlas tabs, I was intrigued. The soccer ball style tread really gripped the glue for the pull, but would release the used glue ring easily. Atlas soon became my favorite tab to use. In fact, my quest to find the ultimate tab has pretty much stopped. For the past 3 years, My tool cart has held Atlas Glue Tabs almost exclusively. They work great! Go over to the Atlas website now for prices and to place your order. Like Atlas Tabs on Facebook.